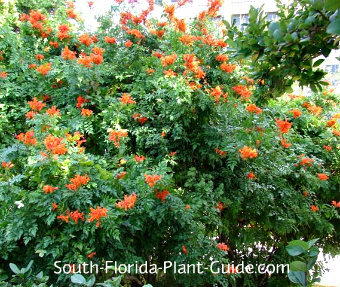 Like jewelry for your yard, gorgeous cape honeysuckle is a show-stopper with its stunning clusters of trumpet-shaped orange blossoms and fern-like foliage. This viney, wide-spreading shrub blooms on and off all year, and makes a fabulous flowering hedge that attracts butterflies and hummingbirds. It can be left to grow very wide and kept at a height you can live with. 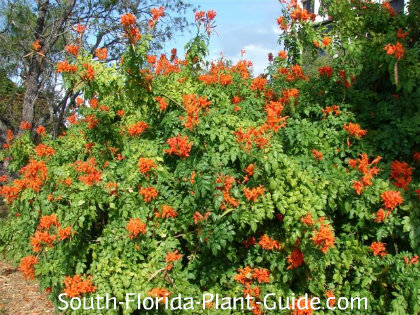 Though it's not a true honeysuckle, plants like these which are part climber and part shrub make versatile landscape plants. Like bougainvillea, it's all in how you train it, trim it, and want it to grow. 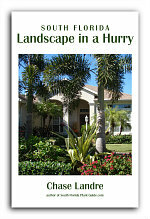 As a shrub or small tree or growing up over an arbor, the plant can be tamed to fit your landscaping needs. 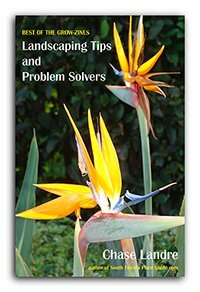 Most homeowners grow it in bush form and it looks best when left to grow wide with a natural shape rather than manicured with hedge trimmers. There are several other varieties with flowers in yellow and peach, though the blazing orange honeysuckle is by far the most popular and more readily available. These are fast growing, evergreen plants that need full to part sun to look their best. They're salt-tolerant and cold-hardy, doing fine anywhere in south Florida. Size is up to you. Cape honeysuckle grows as much as 6 feet (or more) wide if you let it, or it can be trimmed to be about 4 or 5 feet in width. Its height varies...you can keep it 3 to 5 feet tall or let it grow quite a bit larger (and even let it climb, if you prefer). Add a combination of top soil or organic peat moss and composted cow manure to the hole when you plant. Cut the plant back a bit after each bloom cycle. Trim off wandering tendrils now and then to keep it more bush than vine. Water on a regular basis but don't keep it overly wet. Fertilize 3 times a year - in spring, summer and autumn - with a good granular fertilizer. Place these shrubs 3 feet apart if you want them to grow together quickly. Or you can situate them farther apart, about 5 feet, and they will fill in eventually. Keep in mind nearby plants may be overtaken by the wide spread and rambling habit of cape honeysuckle, so allow plenty of room all around. 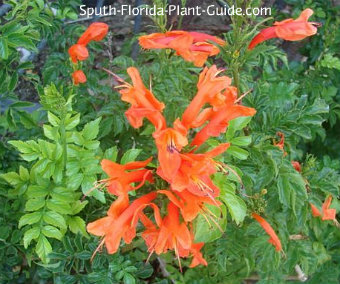 This shrub will do fine in a container, and works very well in planter boxes. 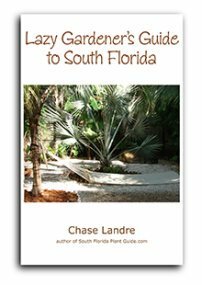 COMPANION PLANT SUGGESTIONS: For nearby plantings, consider sea grape, cocoplum, copper plant, variegated arboricola, bush allamanda, gold mound, and dwarf firebush.